In Washington D.C., several dozen union workers marched in front of a downtown Staples. Hundreds of postal workers stepped off the job Thursday to protest mini post offices set up in Staples office supply stores. The American Postal Workers Union organized protests at 50 Staples in 27 states to oppose a partnership between Staples and the U.S. Postal Service. 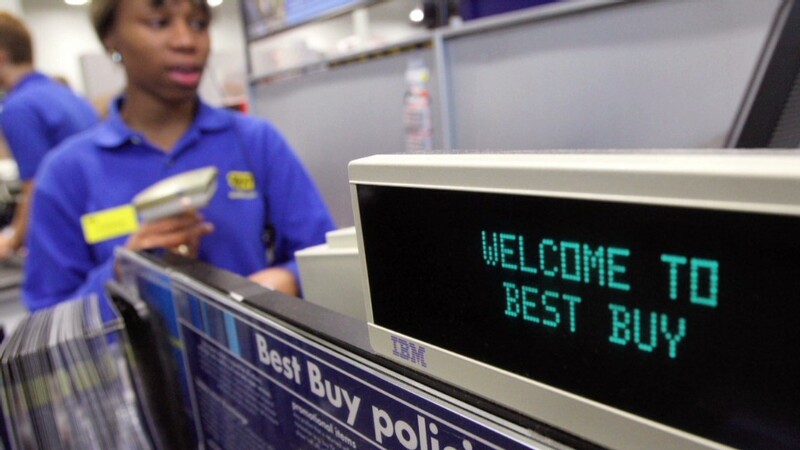 Eighty-two branches of the office supply store have been selling postal products and services since November. While the deal has drawn union ire before, Thursday's was the largest protest. 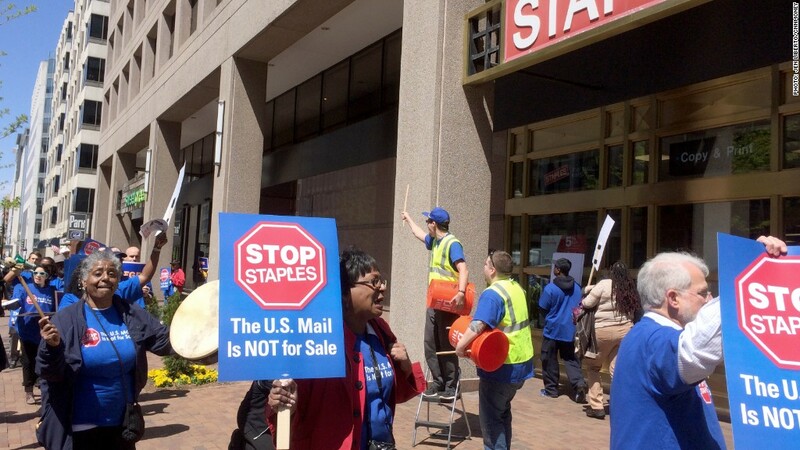 In Washington D.C., several dozen union workers marched in front of a downtown Staples (SPLS), beating buckets and drums and chanting "U.S. mail is not for sale." The unions object to the fact that Staples' mini post offices are operated by lower-wage retail staff instead of postal employees. They claim the deal will move the Postal Service toward privatization, which will shutter standalone post offices and wipe out decent paying jobs. "I'm a third-generation postal worker. It was very important for my family to be able to have a living wage and provide for our families," said Dena Briscoe, head of the Washington D.C. chapter of the American Postal Workers Union. "I want the next generation to be able to have opportunities, such as we had." The partnership, part of a short-term "pilot project," is scheduled to run through September, the USPS said. But according to the union, the Postal Service would like to continue the project past September and expand the program to 1,500 stores nationwide. The unions point to an internal U.S. Postal Service memo, which said the purpose of the pilot program is "to determine if lower costs can be realized with retail partner labor" instead of staff at traditional post office windows. Staples didn't return a request for comment, but a spokesman for the company has told CNNMoney that the program offers "added convenience for our customers." The U.S. Postal Service denies that Staples' mini post offices will replace bricks and mortar spaces. Postmaster General Patrick Donahoe told postal workers on Wednesday, in a recorded message, that "we have no interest in privatizing the Postal Service." He said the Staples deal is one of several underway to "grow the business." The agency lost $5 billion in the fiscal year ending Sept. 30, 2013, the latest in several years of losses. The independent, self-financed agency has exhausted a $15 billion loan from taxpayers to make up for shortfalls. Much of its cash problems stem from a congressional mandate to make annual $5 billion payments for future retiree health care benefits. But declining mail volume has also played a role. Last year, 2 billion fewer pieces of mail were sent compared with 2012.